So you basically got yourself a new 3DS as a replacement in lieu of having Isabelle repaired, aye? huckleberrypie Wrote: So you basically got yourself a new 3DS as a replacement in lieu of having Isabelle repaired, aye? Ja. It's ridiculous that Nintendo refuses to honor warranty just because I'm not in a country they have a presence in (and I accidentally bought mine from a store that sources their stock from someone who is not the official distributor in Malaysia), and the shop I bought it from wants it back for a few weeks, and I don't trust them before I got my important data transferred out. 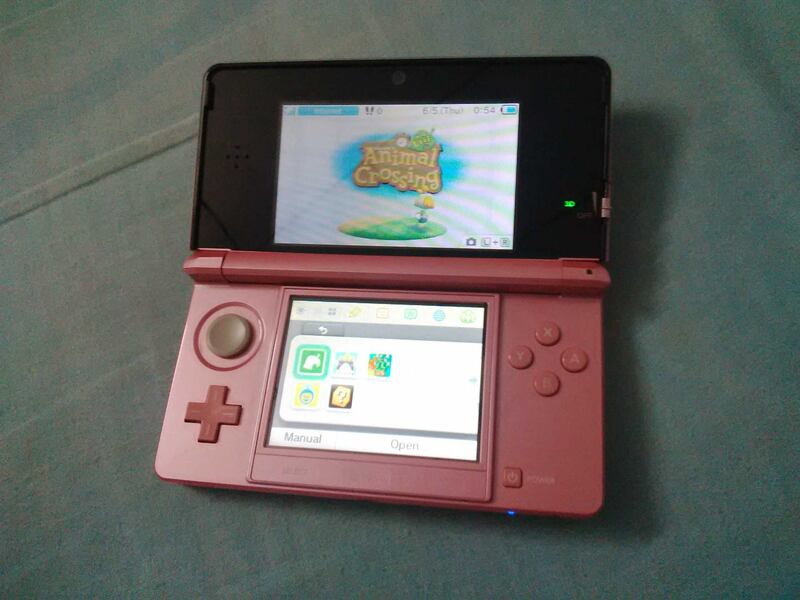 Finally, after a lot of finding, I got me a normal 3DS to replace Isabelle whose hinge is going to break. The data all transferred over fine. Even Animal Crossing New Leaf, which is supposed to be a special preinstall on the original Isabelle since she's an ACNL special edition 3DS XL, came over. However, the other villagers were unhappy that I vanished for five months straight. Also, this does not bode well with my wallet. Now to locate screen protectors and safety cases. Which would be exponentially harder to find compared to 3DS XL parts. I have the safety case for Clifford, which is actually one for a DSi and in bright pastel blue color, and has spots for his charger, headphones, and up to 25 game cards. I found it on fire sale at Kmart last fall. I actually wanted the Cyan 3DS, which would have been named Norville, but the local ShopKo didn't have that color in stock; it was either Cosmo Black or Fire Red. I went with the latter. I feel a screen protector isn't necessary for Clifford since the screen is already protected when closed. I don't use screen protectors for anything because I just think they are too much of a hassle to put on and they may end up clouding the image somewhat. As for Animal Crossing... I'm not doing so well with my town either, but I have only been away for about a month. Perhaps I should check back in today since there are bound to be cockroaches around my house and weeds to pull. It will probably be another full year before I dig in to New Leaf. I still feel that I haven't spent enough time with City Folk. This would be better if Nintendo allowed you to transfer your CF town to NL. RE: Screen protector: I want screen protectors because said clouding is what I intend to prevent. The screen isn't really glass. The stylus can cause scratches. Screen protectors add a security layer so the scratches aren't permanent and when the screen clouds up, I can just replace the protector instead of replacing the entire lower screen. Honestly, this is also why I don't use the stylus unless absolutely necessary. The more I hold the original 3DS tho, the more I feel that a case protector isn't necessary because of the finish (thin layer of transparent plastic over the opaque plastic- something the 3DS XL lacks). On the other hand, I worry about scratches on the transparent layer as well. So yeah. That's also the reason as to why I use screen protectors for my phone, even if the glass itself is claimed to be scratch-resistant. IDK.... even if screen protectors do indeed work, I still think I can do without them. Let's just say I have had bad experiences with attempting to use screen protectors, and the LCD viewing quality didn't seem to be as crisp with one on. Then again I might have just used cheapo screen protectors. One more thing... I always find it disappointing when someone, anywhere, mentions they are downloading a new 3DS game rather than getting it on the physical game card. (full disclosure... it was a random Twitter account of a great furry artist) Personally, I wish people would realize there are advantages of physical cartridges over digital downloads. You have heard my arguments for physical media before, so I won't repeat them. Physical media may require game swapping or investing in a case that can hold multiple 3DS/DS game cards, but in the end, I feel it's worth it for the longevity of your game library. And, you actually own the game you bought. And, this further proves my motive for physical media. cpd2009 Wrote: IDK.... even if screen protectors do indeed work, I still think I can do without them. Let's just say I have had bad experiences with attempting to use screen protectors, and the LCD viewing quality didn't seem to be as crisp with one on. Then again I might have just used cheapo screen protectors. Well, let's just say that I'm just very worried about the screen, having seen the screens of the touchscreen point-of-sales machines at various venues. As for digital downloads, it works two ways. Game cards wear out too, if not the contacts of either giving in first. Also, patching bugs is easy now. Nintendo actually had a mass recall of a Harvest Moon game that was released on the GBA because a bug caused the game to freeze at a certain point (I think it was when you tried to marry a particular girl in the game) and no-one caught it until the game went gold. If you were in Asia, tough luck- you need to somehow buy the new version of the cartridge since Nintendo won't accept your returned cartridge due to your return address not being in the US). With online downloads, it would be as simple as just downloading a updated version of the game. Then again, eShop not available in Asia, but even Nintendo's South East Asia distributor suggests spoofing your location and buying top-up cards online. On the other hand, Nintendo's method of handling their online presence is pretty much haphazard. Region locking on a console -especially a portable one- and unavailability of the Nintendo Network in two thirds of the world is bad enough (did they miss the news that going region-free saves them money? ), but then they do things like locking a game to the console instead of an Nintendo account. I was lucky that I stopped using Isabelle I as soon as I noticed the cracks so I can preserve her for the day to transfer her data out. Yes, you are given the ability to do this 5 times throughout the life of the console. Of course, it took me 5 months to source a new 3DS (four months of searching plus one month of waiting for the shipping). If I had continue using her until the hinge has cracked, then it would be impossible to get my game purchases out. PS: Digital downloads are inevitable for certain games. For example, for some stupid reason Capcom is only releasing the US version of the latest Phoenix Wright game as a digital download exclusive. Then again, this is the same Capcom who is trying to kill the Megaman franchise so they can put more resources into the Street Fighter franchise. The same Capcom who the creator of Megaman quit out of frustration. RAMChYLD Wrote: Well, let's just say that I'm just very worried about the screen, having seen the screens of the touchscreen point-of-sales machines at various venues. Even if Game cards do eventually wear out, they can still outlive the digital version if the publisher or Nintendo pull it from the eShop and prevent users from redownloading it again. Another thing... Atari VCS game cartridges are still in playable condition, and they are nearly 40 years old now for the earliest titles. They are far simpler internally, but still use the basic technology. RAMChYLD Wrote: On the other hand, Nintendo's method of handling their online presence is pretty much haphazard. Region locking on a console -especially a portable one- and unavailability of the Nintendo Network in two thirds of the world is bad enough (did they miss the news that going region-free saves them money? ), but then they do things like locking a game to the console instead of an Nintendo account. I was lucky that I stopped using Isabelle I as soon as I noticed the cracks so I can preserve her for the day to transfer her data out. Yes, you are given the ability to do this 5 times throughout the life of the console. Of course, it took me 5 months to source a new 3DS (four months of searching plus one month of waiting for the shipping). If I had continue using her until the hinge has cracked, then it would be impossible to get my game purchases out. According to that article I linked to, Nintendo won't replace your digital content if your 3DS or Wii U system end up getting stolen due to your download history being tied to the console and not a Nintendo account. If Nintendo would dump the silly 5-transfer-limit system and tie your downloads to a Nintendo account, this wouldn't be a problem. RAMChYLD Wrote: PS: Digital downloads are inevitable for certain games. For example, for some stupid reason Capcom is only releasing the US version of the latest Phoenix Wright game as a digital download exclusive. Then again, this is the same Capcom who is trying to kill the Megaman franchise so they can put more resources into the Street Fighter franchise. The same Capcom who the creator of Megaman quit out of frustration. Capcom loves digital distribution and were one of the first game companies to use it. They are also in love with the Free-to-Play model and microtransactions. Digital distribution would only be ideal for me if I actually own the game I purchase, and I am given the ability to back it up onto a flash drive, SD card, or any form of physical media, without resorting to hacks or unofficial methods. With many digital purchases, you are just given a license to use the game, and if Nintendo or Apple or whoever owns the content decides to pull the game due to rights issues, you are screwed. Amazon has already remotely deleted certain Kindle eBooks from users devices, and Apple has such function built into iOS. There are some games that I do buy that are digital only, but they are limited to certain DSIWare, WildTangent, and Android games. I buy them because a physical version is normally not readily available or it's so cheap that it is not a big deal if I have to repurchase the content later. If the game was priced near retail ($40 to $60 USD) it would be a different story. I have to take a chance with these, and enjoy them while I can as they might be gone tomorrow. Still, it beats returning a game cart and losing all progress when a game breaking bug has been discovered and a mass recall put out. Sure, it's Natsume's fault for the shoddy bug testing, and even more unbelievable that Nintendo didn't catch the bug with their QC team either. But if things like that happen again, with digital downloads you don't end up starting from scratch.